We're hiring for the Spring 2019 Semester! Gain valuable networking and work experience communicating with alumni, parents and supporters of USD in efforts to fundraise for crucial scholarships. Telefunding is a fun and exciting job where you’ll earn a competitive hourly rate plus bonuses. Telefunding also offers flexible scheduling Sunday through Thursday evenings to work around your academic schedules. Apply today! Download an application. Bring completed applications to Degheri Alumni Center, Room 221 OR email the application to telefund@sandiego.edu. Please make sure to email your file as a .doc or .pdf file, .txt and .pages files will not be accepted. At the University of San Diego Telefunding Center, students raise money for scholarships, financial aid, faculty enrichment, new buildings, technological updates and materials for the library. Each year, a staff of 35 students reach out to over 35,000 alumni, parents and friends to help keep them connected with USD. 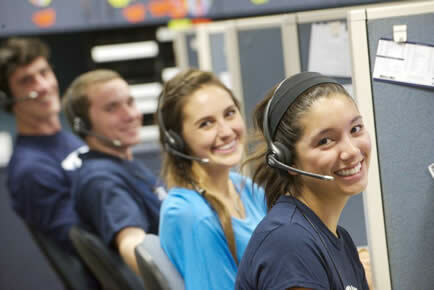 As representatives of the university, telefunding student callers raise over $400,000 each year. Each semester, students are trained over a three-day course to call our alumni, parents and friends to build relationships and raise money for the university. When you receive a call from the University of San Diego Telefunding Center — even if it’s just to thank you for your support — there is a USD student on the other end of the line.